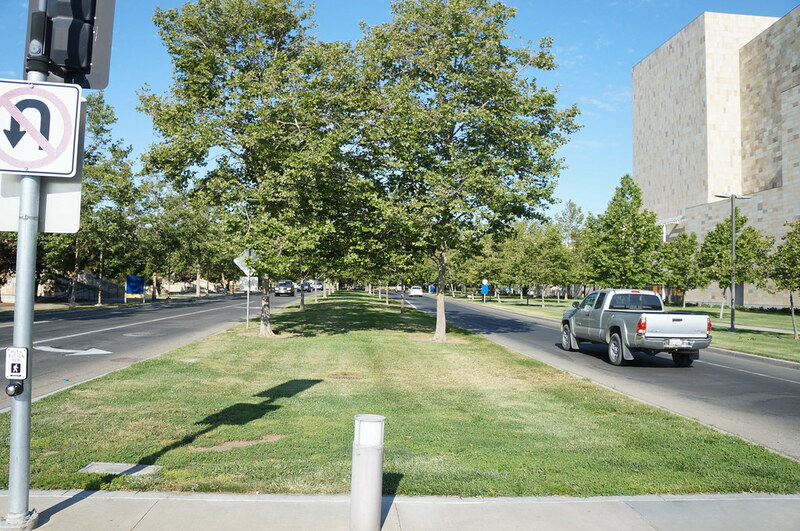 The large median along Old Davis Road near the Mondavi Center for Performing Arts is in the process of being converted to a low-water, region-appropriate landscape. Because it may be a while before funding allows for a full-scale conversion similar to the median along La Rue Road, members of our Grounds and Landscape Services team contracted with an outside company to cover the area with a deep layer of mulch. Spraying mulch onto an area this size (.78 acres or 34,116 square feet) is an economical way to spread a great deal of quality mulch quickly and evenly. Special note: If you’ve thought that the trees along this corridor look stressed, you are right, but it is not from lack of water;. These trees are on a separate irrigation system and will continue to be watered throughout the conversion process. However, this variety of tree, the Platanus x acerifolia ‘Bloodgood’, or Bloodgood London planetree, is sensitive to our campus’s alkaline water, especially during the heat of summer. So, every year they look a little crisp this time of year, but every spring, after losing their leaves in fall, they spring back to life again!